Part 2 of my Nature Valley Granola Bar “Where’s Yours” contest win was a 3 week cruise to the Peri-Antarctic South Georgia Island, a place world-renowned for the abundance of wildlife, and the ease with which you can interact with them. As proof, I offer this, the proudest picture I’ve ever taken. 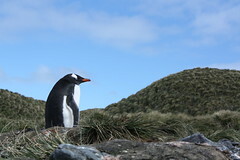 This Gentoo penguin was at least 6 times as adorable in real life as he was in this picture. Gentoo penguins quickly became my favorites. The King Penguins are awesome (and were great to work with in my Doritos Superbowl contest video entry, “Coach of the Penguins”), but for pleasure of watching, nothing beats these Gentoos. If the King’s are like old British men with back problems walking around, the Gentoo’s are more like toddlers, constantly searching for their contact lenses. Nadeev, (my buddy who I took with me) and I were both struck by the fact that so many people were returning to South Georgia. At first, we kept saying “you can go anywhere in the world, why keep going back to the same place?” But looking back with a week or two of perspective, I’m beginning to understand. It’s what the world once was. It’s a chance to look back at how this planet looked before humans got here. Oh My gosh Joel – you are famous!! I am so very proud of you, of course, I am not your mother but we always knew in Youth Group in Dayton t hat you were brlliant.